While I didn’t sample any of the new Rocky Patel cigars at IPCPR, the word on the street has been that Rocky Patel Premium Cigars had a very strong year for their new releases. One of the four cigars that a part of this release was a new addition to the Vintage series. This cigar – the Rocky Patel Vintage 2003 Cameroon features (as the name indicates) a cameroon wrapper. From a personal standpoint, I am a huge fan of the cameroon wrapper and the natural sweetness it could add to a cigar. I was curious to see whether or not the this cigar would live up to the IPCPR Rocky Patel hype as well as my high expectations for a cameroon wrapper cigar. This cigar, delivers some great flavors and in my opinion is one of Rocky Patel’s best releases in several years. Each cigar in the vintage series has a different wrapper. The Vintage 2003 Cameroon joins the popular 1990 (Broadleaf wrapper), 1992 (Ecuadorian Sumatra), and 1999 (Connecticut) Vintage cigars in the series. From my point of view, the rationale behind the 2003 name is twofold: 1) 2003 was the year that Rocky Patel started putting his name on his cigars. 2) The Vintage 2003 Cameroon contains 8 year old (from 2003) filler and binder. For this cigar experience, I selected the Robusto vitola. I particularly liked getting an extra 1/2 inch on this vitola over a typical 5 x 50 robusto. I opted for a straight cut into the cameroon wrapper cap and commenced with the pre-light draw. The dry draw delivered notes of wood and caramel sweetness. While not a complex pre-light draw, it was a very pleasant one. 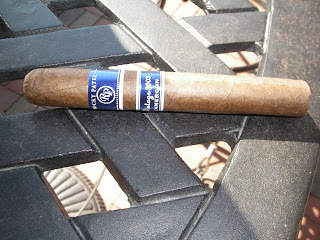 It was now on to fire up the Rocky Patel Vintage 2003 Cameroon and see what it would bring to the table. One thing I mentioned above with the pre-light draw is it wasn’t very complex. This theme holds true throughout the cigar experience. While the flavor profile remained pretty consistent throughout the smoke of the Rocky Patel Vintage 2003 Cameroon, it did produce some outstanding flavor. The caramel sweetness from the pre-light draw continues from the onset of the smoke of the Vintage 2003 Cameroon. The nice thing I liked is that I detected the caramel from start to finish. The caramel never got too sweet and provided a nice balance to the natural flavors of the tobacco. About 10 percent into the cigar, some coffee notes come into the equation and became secondary notes. The Rocky Patel Vintage Cameroon didn’t deliver much in terms of spice on the tongue, but I was able to detect some spice on the nostrils. There was a hint of pepper spice and citrus on the last end of the cigar, but the Caramel sweetness does not lose its edge. As for the finish – it was perfect. 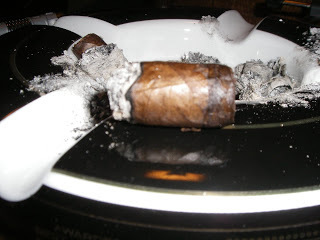 The nub was firm and cool – the way a good nub should be. There were no harsh notes at all as it smoked as smooth as it did throughout the cigar experience. For the burn and draw attributes, the Rocky Patel Vintage 2003 Cameroon scores high marks. This had a razor-sharp burn throughout the smoking experience. It required very little in the way of touch-ups and it burned at a perfect rate and perfect temperature. The draw was as good as a draw can get. This cigar was a textbook study on a well-made cigar. The Vintage 2003 Cameroon isn’t going to be a very strong cigar. It won’t overwhelm you with nicotine and it’s a solid medium in terms of strength. The strength it does provide balances very well against the depth of the flavor notes. The flavors produced by this cigar have depth and easily allow this cigar to land in the medium to full range on the spectrum for body. I mentioned above that this was one of Rocky Patel’s best releases in recent years. I’m also confident saying this was one of the best cameroon wrapper cigars I’ve had in recent years. While I mentioned this was not a complex cigar in terms of flavor transitions, it does provide great flavor – proving a cigar that is in this profile can be a great cigar. I would not hesitate to recommend this to both novice and seasoned cigar enthusiasts. This would also be a cigar that would be box purchase-worthy in my book. Source: The cigars for this assessment were purchased from Empire Cigars in Raleigh, North Carolina. « Cigar Review: Viaje White Label Project (WLP) 50/50 Red	» Press Release: ANGELO DUNDEE CELEBRATES 90th BIRTHDAY WITH A BOX OF CIGARS FROM TORAÑO FAMILY CIGAR CO.